Parkridge Community Organization (PCO) is a non-profit group committed to the well-being of the Parkridge neighborhood in Knoxville, Tennessee. PCO formed in 1982 and has worked on historic zoning issues, an annual neighborhood home tour, crime issues, and neighborhood social gatherings. Parkridge is an urban neighborhood with a variety of homes ranging in style from Queen Anne Victorians to Arts and Crafts Bungalows. The houses are close together; with sidewalks connecting its residences to major roadways and businesses. The neighborhood is less than 2 miles from downtown Knoxville (figure 1 below). Parkridge is a racially diverse neighborhood. There are 1,800 residences with 2,774 people living within Parkridge. There are 9 churches and 6 non-profit organizations based within the neighborhood. Parkridge has gained notoriety for having the largest concentration of George Barber homes in the nation. PCO holds monthly meetings at 6:30 p.m. on the first Monday of every month at the Cansler YMCA. You can also view past board meeting minutes. Figure 1. 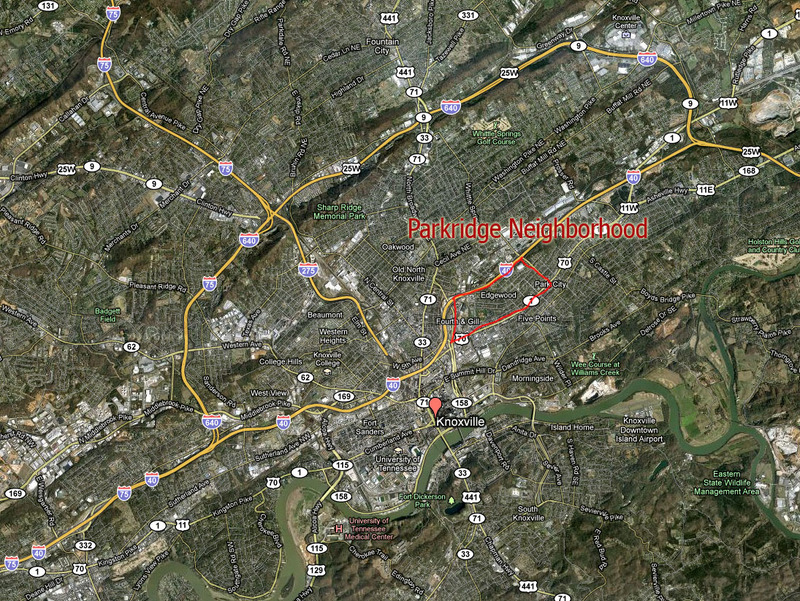 Parkridge neighborhood’s location within Knoxville, TN.